"10.It is using the newest SUNPLUS main chip which is special for car dvd, and stand fire highly. Can avoid system halted after use for long time. 23.Support 32 Bit & 8 bit games, with wireless&wired joystick. Total 2300 games on one CD. 24.You can download games through the Internet into Memory Cards. 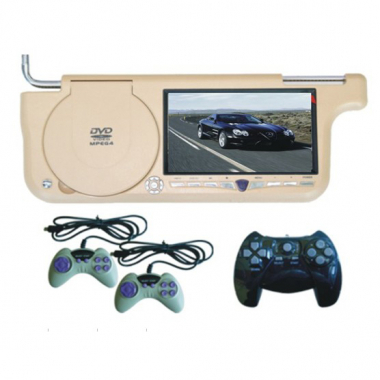 This sunvisor car dvd player with TV is easy for installation, just replace the old one, we suggest you install on the passanger's side for security reasons, When you are on road, this is best choice to amuse the passengers and help to kill time. Just tell us in which side you need to install, right or left sides are both available.